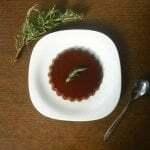 The raw cacao pudding and fresh rosemary is a light sweet, with few calories and perfect for those times when you are on a diet but you can not resist a sweet little treat. However good we may be, we can all have a moment when we need something sweet, why skip the diet and feel guilty when there are healthy, rich and cacao-flavored alternatives? Today I present my recipe for the pudding of raw cacao and fresh rosemary. Enjoy your dessert with no regrets! This recipe is compatible with the Fast Metabolism Diet – FMD Phase1, Phase2, and Phase3; This recipe does not contain any staples of this diet, so it is considered an extra, does not replace any other food.